Hello! Welcome to the Taylored Expressions March Spotlight Day! All of the products that we have been peeking the last couple of days are now available in the TE store in the Fresh Out of the Oven Department! Today I have a couple of projects to show you. The first one uses the newest Graphic Greetings stamp set - Thankful. I also used a portion of the new Chevron Cutting Plate. Next up is a 6x4 card for my Project Life album. I used the newest Moka girl, Moka Meredith! Isn't she a cutie?! 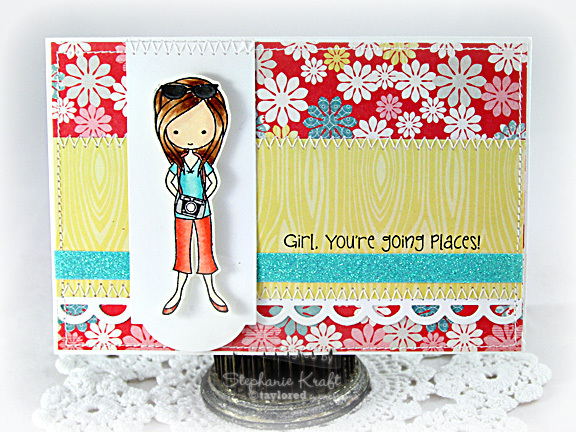 Accessories: Taylored Dies: Chevron Cutting Plate (Taylored Expressions), Rectangle Nestabilities – SM (Spellbinders), Markers (Copic), Pearl (Kaisercraft), Wood veneer arrow (Studio Calico), Crinkled ribbon, Foam tape, Thread, Sewing machine. Accessories: Taylored Dies: Open Scallop Border, Banner Stacklets 2 (Taylored Expressions); Markers (Copic), Aqua glitter tape (American Crafts), Glossy Accents (Ranger), Foam tape, Thread, Sewing machine. So cute! Love the way you used part of that cutting plate as an accent. And Moka for Project Life is such a great idea! Both cards are a delight!! Love the new Moka Meredith and the Graphic Thanks! You did a great job showing them off. Thanks for the inspiration. Hi Stephanie! I agree with Jami - how cool to use just a piece of the cutting plate - great idea! Your cards are so happy and bright! Have a nice weekend! These are so pretty, Steph!! What great cards! I love the background and the tiny arrow on the first one! Great way to use the chevron die cut too! Ooh Both of these are Fabulous Stephanie!! 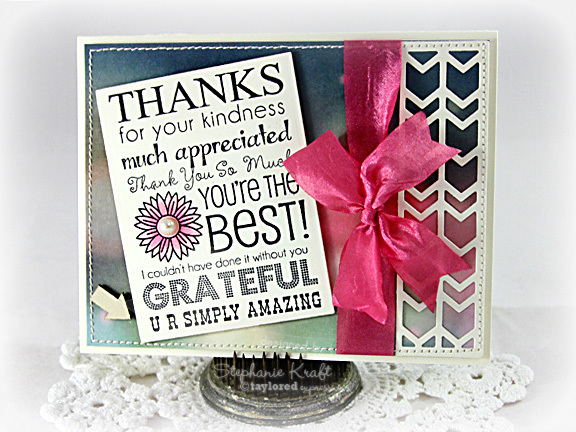 Love that you used a portion of the chevron cutting plate!! Looks Fabulous! And your Moka Meredith is soo Adorable!! Love the fun Cheery dp's you paired with her too! Just beautiful, Stephanie! The Moka Meredith card is adorable!